When these needs are not met, children tend to drop the sport. Not all people are created equally. We all know this saying, right? However, somehow, this doesn’t seem to translate over into the children’s world of sports too often. We are seeing more and more that Coaches and parents alike, are presuming that every child is/should be on the same level as their peers, and if they are not, well then, that’s just too bad. Children need to be challenged depending on their level of ability, meaning that this may call for more work/creativity from Coaches. If a more advanced athlete is among an athlete that may not have the same abilities or be able to catch on as quickly, this shouldn’t mean that the Coaches give them responsibilities the same as their peers. It simply means that maybe the workouts are tailored differently according to the ability of the young athlete. This does not mean, however, that it slows the training/advancements of another athlete that may be a higher performer, but it does mean that a coach will have to go the extra mile to tend to athletes with different abilities. Too often children are feeling left out because the advanced athletes are the central focus, causing them to lose interest and quit. Let’s take another look at an article that emphasizes top reasons why children play sports. SO, how do we ignite that spark in children to become motivated from within? What our mother did do for us, however, was create an inspirational figure. I’m going to tell you a little story…it is one that is on our website in the About Us section, but I can’t tell it enough because as I sit here writing this blog today, I am reminded of such sweet memories of my athletic career. A lot of people may not say the same about their past athletic experiences, but for me and my siblings, we thrived in sports from within and I attribute most of that to what our mother brought to life for us in a simple concept that we here at Bouncing Bunch want to share with you and your children so that they may be able to experience some of the great successes that we had! After we went to bed, she pulled out some yellow fabric, wrapped it around a round pillow, sewed felt eyes onto it, and some big, red lips. She called her Vollie and from that moment on, Vollie became our mentor, friend, and confidant. Our mother sat back and smiled and when we were finished she began to tell us the journey of Vollie. She said when she was sleeping last night there was a knock on the door. As she opened it, Vollie introduced herself and told her she was here to help 3 great little athletes improve on their tennis game. She said there were certain rules involved in how Vollie helped out and should we listen to them, Vollie would come to life in the middle of the night, and leave a reward under our pillow at the end of each week. She also explained to us that if we didn’t do the things Vollie had set forth, it would make her very sad and she would have to leave and find other children that really wanted her help and were willing to listen. This was a monumental day for all of us as the gears in our little minds slowly turned and settled on a mindset of excitement for tennis, not frustration or as a chore. The desire to impress our new magical friend with the best performance we had, began to grow. The sheer thought of letting Vollie down after her long travels and strategically picking the three of us as her children to help was something we would not tolerate! The reality of it all started to sink in. A new form of pride to impress her with our discipline, drive for tennis, and motivation to perform our physical exercises started to ignite from within. We would not let Vollie down! As we sat in our seats around that kitchen table, looking back and forth from our mother to Vollie, we knew that our lives would forever be changed. Our mother explained to us that while we were at school, Vollie would tell mom key elements that we would need to start incorporating into our normal physical activities that would be important for our success as athletes. That was one of the hardest days for us at school. We couldn’t wait to get home to hear what Vollie had to say. As we raced through the door off the school bus, we hammered our mother with questions of what Vollie wanted us to start doing. We have taken this story that was given to us as children and developed it into a business we now call The Bouncing Bunch where we are making sports magical as they were made to us. The three of us will never forget Vollie and her magical help, good values, healthy eating, and exercise drills she put in place for us. This taught us discipline, self-respect, the internal desire to be the best we could be, and an indestructible work ethic that carried into our performance at school and eventually into our professional careers. There is no child that can’t excel at some type of sport or physical activity if the approach set before them is right. We love athletics in our family and want to give back to others what we have gained. Athletics have taught us invaluable lessons and shaped us into the people we are today. Do you want to win more than your child? Many parents have to stop and ask themselves, who wants to win more in sports competitions? Me, or my child? If you google parent struggles with children and sports you will be amazed at how many write ups are posted with the common denominator being how parents are ruining sports for children. While most everyone of us wants to win in life and become a great success, research has shown time and time again that today’s method of parent/coaching is killing any motivation for children to be successful in sports. Being the recipient of a college scholarship in athletics, I feel like I might know a thing or two when it comes to hard work, competition, and what it takes to achieve that athletic scholarship. One thing I know to be true is it must come from within. You can force your child to do what ultimately you wish you had done…this seems to be the big thing these days, people wanting to relive their own lives through their child, but ultimately this will backfire. Growing up, I was the observer of a sister and brother who were both incredibly successful tennis players. They went on to obtain scholarships at top schools as well. By the time it came down to me, my parents were burnt out. They saw my passion for tennis wasn’t there and while they tried to get me involved initially, they could tell that tennis was not for me and rather than waste more time and money, they decided that I would either explore other avenues or maybe sports weren’t for me. After all, maybe it was expecting too much for all 3 of their children to get athletic scholarships? As it turned out, we did all 3 receive athletic scholarships, and this is why I know it comes from within and if your child wants it bad enough, it will happen. When my parents checked out, something sparked within me. I had such a drive and motivation to find something in sports that I would be great at, and then it happened on one crisp Spring day on the track. Turns out, the high jump was what I excelled at and had an incredible amount of passion and drive for. So parent’s, my advice to you is let your children explore different sports. Don’t force them to live out your dreams, but rather their own. My parent’s gave me the option to do whatever I wanted in athletics and I soared very high. Let’s instill a positive approach with free will at the forefront and see how far your children will go! As long as they are involved in some type of physical activity, they are already ahead of the game. Our goal is to keep them in sports, not drive them away. In light of the BB&T Tournament going on in Atlanta, we are currently focusing on all things Tennis. Woot! Woot! We were very excited to see our very own Georgia Bred John Isner defeat Marcos Baghdatis 6-3, 6-3 in yesterday’s match! Congrats John Isner!! How do people like Isner get to where they are in pro-athletics you might ask? Let’s start with the basics. In tennis, a crucial, but oftentimes forgotten basic is how to hold your grip on your racket. Just take a look at the link below to understand why grip is so important for your tennis game. Whether your child is trying to become the next Roger Federer, Serena Williams, or just loves to play tennis, grip can make or break you. This article outlines the essentials and we found it to be very informative for Tennis athletes. As always, we love to hear your feedback so please feel free comment! 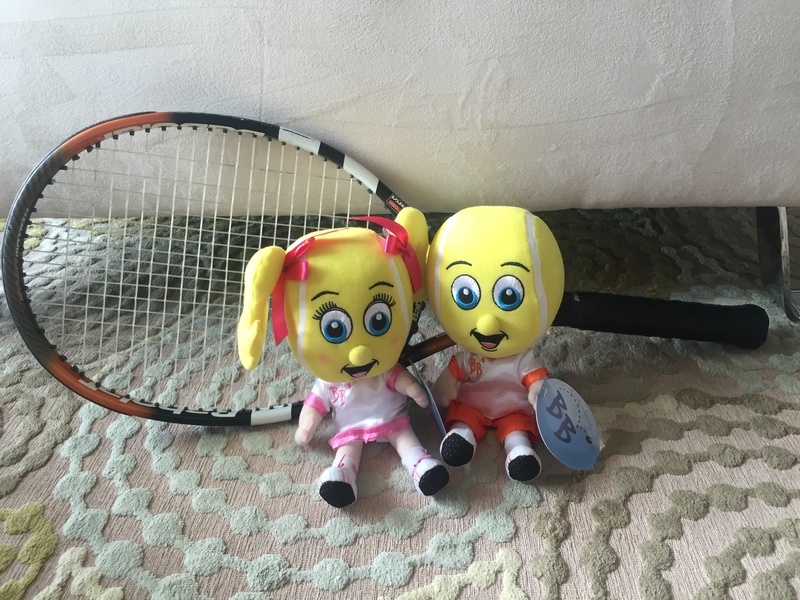 We love Tennis at the Bouncing Bunch! BB&T Atlanta Open Going Strong! That’s right folks…for all of you tennis players out there, the BB&T Atlanta Open is going strong. Mardy Fish and Andy Roddick took Yen-Hsun Lu and Jonathan Marray by storm in a 7-6, 6-4 doubles match on Wednesday 7/29/15. Mardy Fish has just announced that he will be retiring after the U.S. Open so catch these guys while you still can! Tickets are still available. Ace and Vollie will continue to post updates for everyone to follow! At the Bouncing Bunch we love videos like this. These kids are full of life and energy. The most important thing we should always remember is to never let go of the enjoyment we get from our physical activities. We want to be the best we can possibly be and that means that you must enjoy what you do! Don’t ever let anyone tell you you aren’t good enough or can’t do something! Kids? Sports? Or just plain bored? Sounds like you need to read this! Summer is almost over and you’re thinking, what next? It’s the time of year when those Halcyon days that we all love so much have to come to a screeching halt. I remember when I was little and would see those horrible back to school commercials for trapper keepers(remember those? ), and school supplies that I wanted nothing to do with, during the rare moments where our mother would actually let us sit and watch some T.V. Anyway, I hated them. No more lounging about in bathing suits and sleeping in. When I take trips down memory lane, I try and forget those. However, I digress….. Parents don’t get to do that sort of thing anyway, right? Most of us are aware that with school starting up again, the involvement of your kiddo(s) being part of a sporting program is probably the next thing to tackle on your list. After all, we wouldn’t want them ending up like good ol Spicoli. Now, although I am not a parent, I am a former athlete so I do know a thing or two. As a former athlete, and a child of highly involved sporting parents(a lot of you know the type), I also know that questions pop up with parents as they are considering enrolling their child into a sport or sports program(s). I came across this article and thought I would share it with you. Dr. Sally Harris is a Physician in the Pediatrics and Sports Medicine Dpt. at Palo Alto Medical Foundation. She goes over top questions that parents have regarding children and sports. I think these are good little pearls of wisdom to have at your fingertips if you are a parent who is ready to enroll your child in sports for the first time or if you are fairly new to sports with your children. As always, we love hearing your thoughts here at Bouncing Bunch!